Do not surrender to the self styled critics who are hell bent on disrupting the screening of PK. We live in a democracy and freedom of expression is our birth right. And please do not deny yourself this exhilarating experience, on the whims of certain individuals who in all probability have not seen the movie in the first place. It doesn’t matter which religion you might not belong to, go view it as a piece of refreshing art. In all simplicity how can we allow an alien from another planet to initiate a law and order problem on ours? As a rule if a movie is cleared by the censor board, it should be illegal to disrupt it’s screening anywhere. 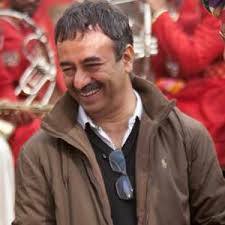 With this fourth movie Raj Kumar Hirani, can easily be called the torchbearer for morality in Bollywood. He likes to make movies with a social message, which end up stirring our souls and move us to sit up and think. 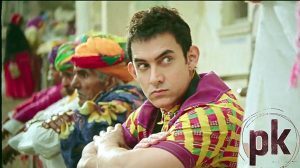 Like his other movies PK starts by making us comfortable and soon a warm fuzzy feeling envelopes around. And when we are at our most vulnerable , he starts peeling off the dead layers. Most of us come out feeling righteous, ready to take on the world and elevated. We bet you will emerge guilt free and with a lesser stock of sins. 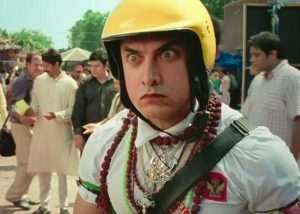 PK is a fine example of smart filmmaking and almost all of the credit goes to the director and his super effective screenplay. The movie plays on our innermost feelings and forces us to feel every emotion, and does not tell us to think. The movie will make you cry, laugh and have pure fun. It is worth every penny you pay for the ticket. In the early part of the movie we meet Anushka aka Jagat Jannani aka Jaggu, in the shortest bob possible, cycling on the streets of Brussels. She falls in love with a Pakistani named Sarfaraz, played by Sushant Singh Rajput, who we wonder in what frame of mind agreed for this insignificant role. They fall in love, but her conventional Indian father played by Parikshit Sahni, throws a fit and goes running to a Tapasvii baba ( Saurabh Shukla) to drill some sense in his daughter. She gets dumped and returns to India to work for a news channel headed by Boman Irani. While this Jaggu drama is happening, in a remote village in Rajasthan an alien has just landed from his space ship, with a sparkling green locket in his neck. Mind you on his planet people have no concept of clothes. Soon a greedy villager steals his locket, and he jumps onto a speedy train leaving the alien with a tape recorder to cover his essentials. It is soon revealed that the alien Amir Khan, needs the locket in order to return to his planet. He finds a true friend in Sanjay Dutt, with whose help he learns to speak in Bhojpuri and understands the earthly concept of clothes. We must mention here the concept of the dancing car, from where he picks up clothes as gifts, is a brilliant trope. He soon realizes that it is only God who can locate his remote for him and help him get back to his planet. His journey in search of God starts here. The alien’s take on our world, makes us cry, laugh and forces each one of us to ask some innocent questions. His innovative fixes and stimulating ideas keep you riveted to your seats till the last frame. The energy that Sanjay Dutt brings to the screen is electric and unmatched. Anushka looks very pretty and naïve, but sadly is very boring – too much goodness is not easily digested. The movie is on a mission to figure out how each God operates. But we need to clarify that the movie focuses on how a faith is practiced, rather than the faith itself. None of the songs are timeless but are beautifully paced and suit the movie well. Tapasvi Maharaj the main antagonist of the movie is played well by Saurabh Shukla and surprisingly does not evoke any hatred. The moral of the story is that God is one and he is good, however, be wary of the godmen. On the whole get ready for an overwhelming experience, with tricks that will touch your heart and an upheaval of emotions that will leave you overwhelmed. And please do not move out before the last frame, as the cherry on the cake arrives right at the end. Next articleHow to Dial a Right Number?